Years ago I planted a New Jersey Tea sapling, Ceanothus americanus. It's such a shame most of the mail order nurseries sell this shrub as a 4inch plug. It would really be nice to get it as a quart or gallon size pot instead of treating this like something you'd install in a meadow garden, to be mowed or burned at a later date. NJ Tea is a nice little shrub with a 2' to 3' round habit. It's touted as a hummingbird plant, not because of the flowers, but because of the droves of tiny insects that come to pollinate it. 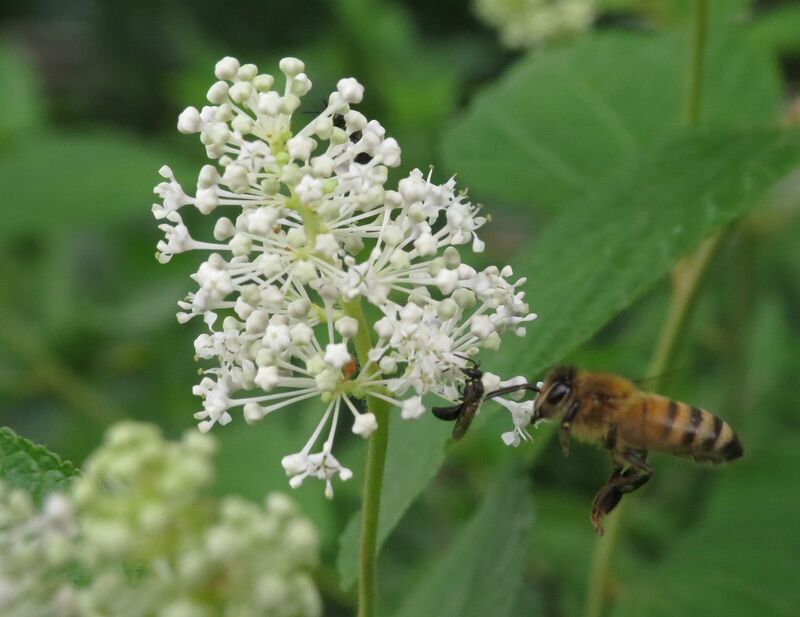 When flowering, these plants are absolutely swarming with little bees and solitary hunting wasps that are overall beneficial to have in the garden. 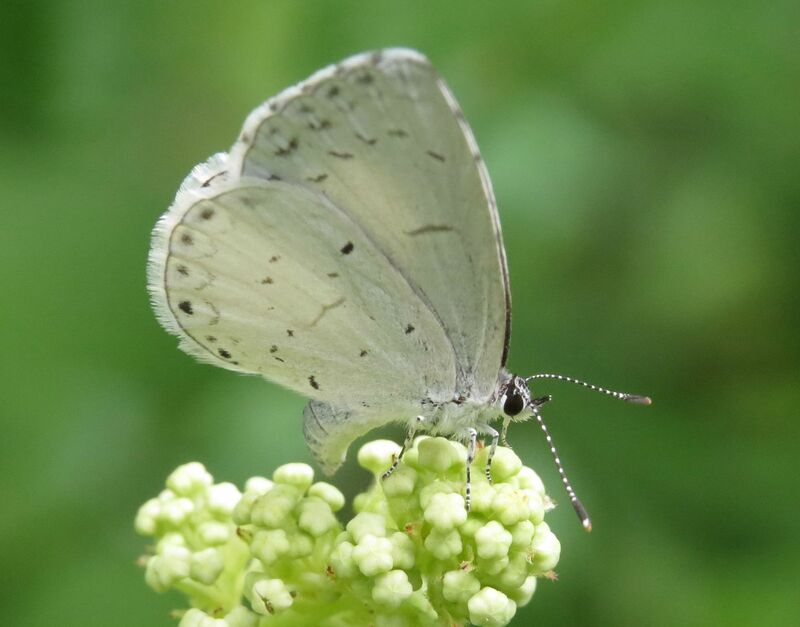 Sadly, despite distribution charts showing how common this species is all across the eastern US, it's in something of a dramatic decline and becoming very hard to find in the wild. Part of the problem was that farmers used to believe this plant was a sign of good soil and bulldozed whatever habitats it grew in for farm land. Where it still grows today, it's easily shaded out by tall perennials and encroaching forest land. 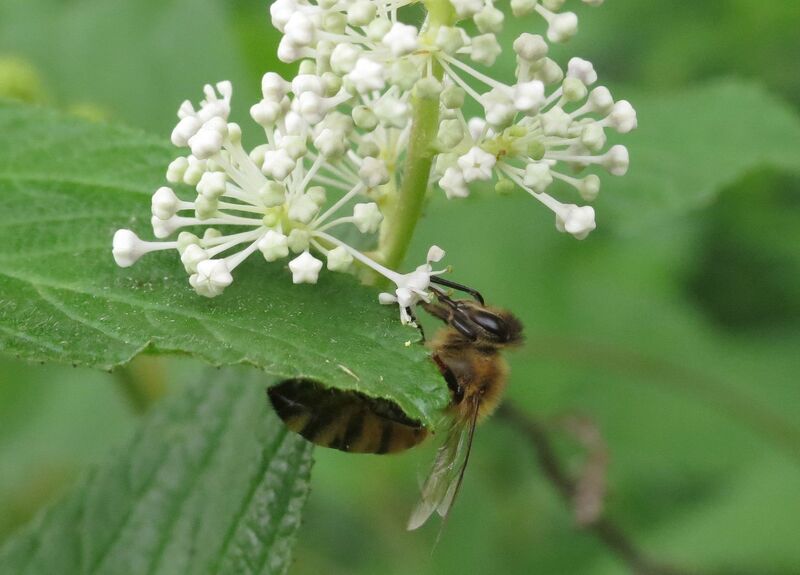 What makes it worth blogging about today for me is the fact that my honeybees started working it. This is odd because I almost never see honeybees bothering with plants who's flower shape and nectar is gear more towards wasps and smaller bees (as seen above). Most of the flowers aren't open yet so it's not bustling with swarms of other pollinators just yet, (and I've never seen a hummingbird go near the thing,) so I'll see if this wasn't just a curious couple of foragers or if the honeybees really do want to work this plant. 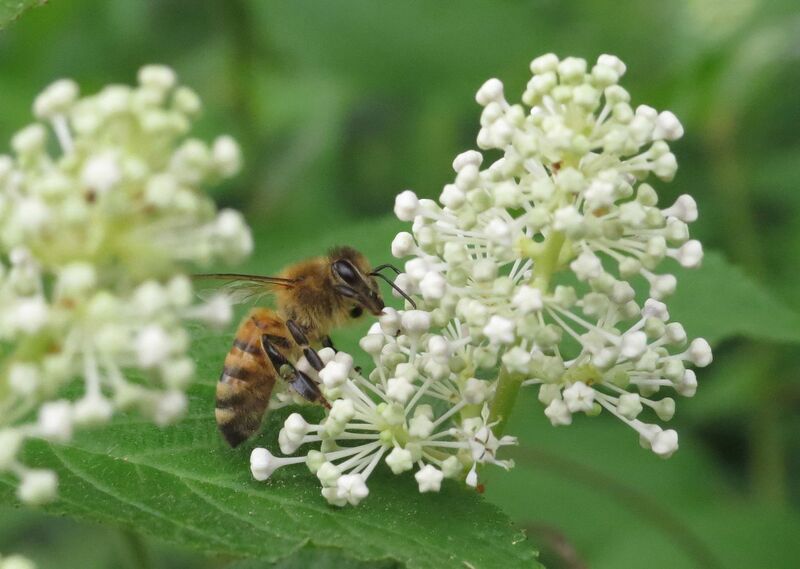 Honeybees working a native plant isn't always a good thing for nature. Many conservationist view this as stealing food from the native bees. I'm not sure of any specialists pollinators of this plant though. Western Ceanothus species and their bright blue flowers tend to get a lot more honeybee attention so I guess this isn't entirely unexpected. Sadly I don't know of any western Ceanothus that's hardy in New Jersey or I'd have tried growing it by now. 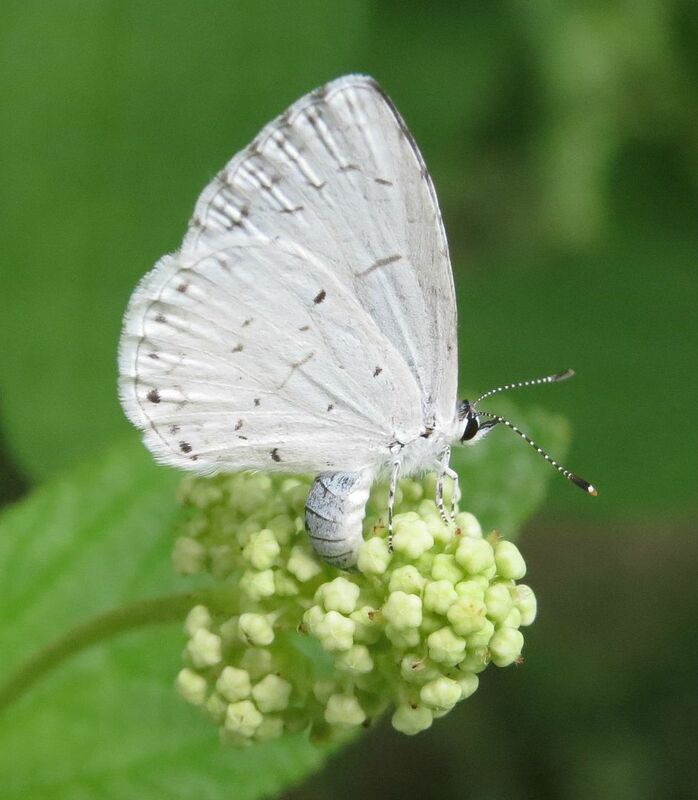 Also while photographing the honeybees I noticed what I believe to be a Holly Blue butterfly, and she was laying eggs! 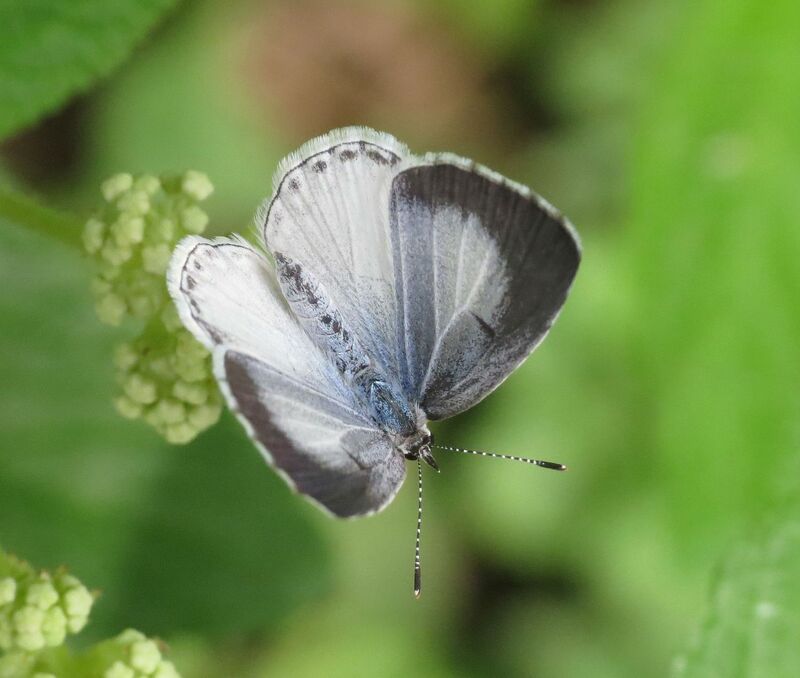 Blue's and Azures are neat butterflies because the caterpillars have special relationships with ants. A failing of most butterfly species is they fall prey to ants all too often. They'll strip the eggs right off the host plant before they hatch, young instars which haven't developed a defense strategy or adaptation yet are an easy meal. I've seen whole clutches of hatching giant silk moth caterpillars get chewed up into a gooey pulp by a single carpenter ant which then carried the mess of caterpillar goo back to the nest. This genus (family?) has a different strategy though. For starters they lay their eggs among the unopened blooms on the plant, which is good enough camouflage. Early instars need to eat a little but quickly start to secrete a sugary substance to feed the ants. The caterpillar also "sings" to the ants, making sounds and vibrations like a queen ant might produce. The ants will hang around the caterpillar as it feeds and helps protect it against other predators. Some species will actually overwinter inside ant's nest, either mimicking the larva or a queen ant, which then pupates over the winter and emerges from the colony next spring. It's a complex life style for sure. I theorize that not all species of ants are ideal to overwinter inside of. Some of the species that are more finicky about their host plants are uncommon or endangered, such as the Karner Blue Butterfly, which only lays eggs on Lupinus perennis. So if I get a chance to I'll try and photograph the caterpillars, ideally with ants tending them but I can't promise anything. The eggs she laid were almost microscopic and the caterpillars are absurdly small. Also later instars might prefer consuming ant eggs once they're inside a nest so I may have to setup a fragment colony. Keeping an eye out for chewed up foliage can help home in on where the caterpillars are. 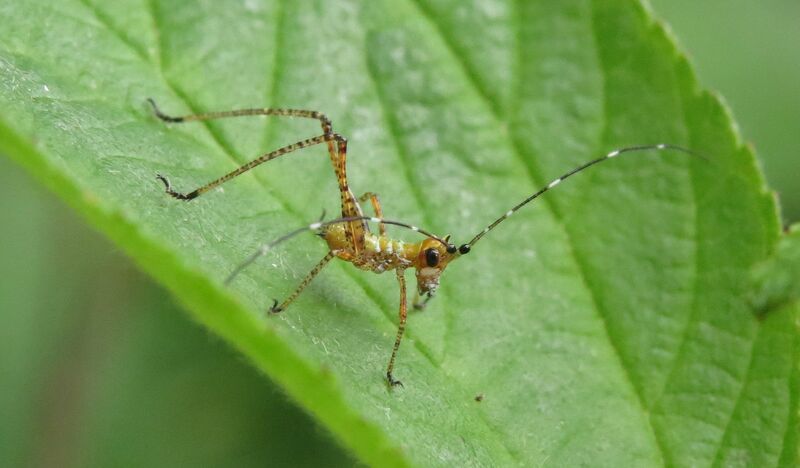 Though finding a Katydid nymph on the plant suggests that might not be the best strategy. I'm tempted to go out and snip off a few flower heads where I know eggs were laid and put them in the outdoor butterfly cage to raise myself. I've never kept a species so small though.